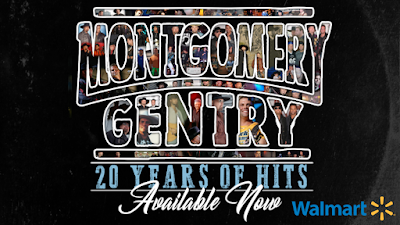 To celebrate 20 years of making music and entertaining fans, Montgomery Gentry has released "Montgomery Gentry: 20 Years of Hits." This is a very special project (recorded during the "Here's To You" sessions) featuring brand new versions of the fans favorite songs, like "Lucky Man (feat. Darius Rucker)" and "Hell Yeah (feat. Jimmie Allen)." Even more featured artists appear on the collection, including Brad Paisley, Colt Ford, Rodney Atkins, Granger Smith and Logan Mize. The album is available now in Walmart and on all digital outlets!